Rod Serling was a smart, skeptical man—smart enough to know where his talents lay and skeptical enough to doubt that those talents ever rose to the level of art. In the last few years of his life, before he died of a heart attack in 1975 at age 50, Serling gave college lectures in which he encouraged his students to rip his legacy apart. Serling had become a sensation at 30, thanks to his Emmy-winning teleplay “Patterns,” and he went on to win Emmys in successive years for his scripts “Requiem For A Heavyweight” and “The Comedian,” both of which are still considered among the highlights of live TV’s “golden age.” Serling then created the science-fiction anthology series The Twilight Zone, and won writing Emmys for its first two seasons. But throughout his rise, Serling battled with network executives and sponsors and worried that he capitulated too easily. Serling wrote some of the best-loved, most powerful television dramas in the history of the medium, but he also worked so quickly and so constantly that he failed to make the most of some of his best ideas. And he knew it. When Serling met with those college kids in the ’70s, he accepted their assessment that even his best scripts were moldy. “They’ve aged like bread,” he nodded. It’s that awareness of his own human weakness that made Serling’s Twilight Zone so great so often. The idea for the show came to Serling after he got tired of seeing his most politically and socially conscious scripts get gutted by the network suits. Regarding his poorly received 1956 teleplay “The Arena,” Serling wrote, “To say a single thing germane to the current political scene was absolutely prohibited… In retrospect, I probably would have had a much more adult play had I made it science fiction, put it in the year 2057, and peopled the Senate with robots.” So after Serling had an unexpected hit with his sci-fi drama “The Time Element” on a 1958 installment of Desilu Playhouse, he sold CBS on a weekly dose of the uncanny, in freaky half-hour episodes shot on film, derived from original stories and adaptations of some of the best fantasy fiction on the pulp market at that time. The Twilight Zone’s format suited Serling’s purple prose and punchy moralizing, and with the help of some talented writers, directors, and character actors, the show quickly became the standard against which other science-fiction shows were measured. Emmys and fan esteem aside, The Twilight Zone was never a huge hit during its original run, and Serling ultimately found himself fighting with his bosses again. The production briefly shifted from film to videotape to save money, and after a brief cancellation, Serling got The Twilight Zone back on the air by agreeing to fill an open one-hour time slot. Neither of those compromises served the show well. Neither did Serling’s habit of using a dictating machine to “write” whole scripts in mere hours, which encouraged him to be unsubtle and unoriginal. Serling swiped ideas from other writers—unconsciously, he always claimed—and sometimes, his Twilight Zone episodes had little more to offer than a crazy twist ending or a heavy-handed message. Yet there’s a reason why The Twilight Zone is still a favorite in syndication, and why it inspired a hit-or-miss movie and pretty good revival series in the ’80s (plus another not-so-good revival in the ’00s). Even the worst Twilight Zones—and there are plenty of those to choose from—are rooted in Serling’s understanding that it doesn’t take much for the normal to shift just a bit and become abnormal. Serling turned small towns, suburban homes, and city streets into staging grounds for the nightmares his audience was already having, often suggesting that the human capacity for superstition and paranoia could be more powerful than any magic spell or alien invasion. The deep creepiness of The Twilight Zone sprung from Serling’s cynicism about institutions, human nature, and himself. Eventually, entire generations would gorge on the Twilight Zone marathons that local UHF stations would broadcast throughout the ’70s and ’80s on Halloween, Friday the 13th, or New Year’s Eve, and these marathons were a major force in securing Serling’s reputation. In single doses, The Twilight Zone can offer a little eerie drama with a pleasant tingle at the end. Taken in bulk, it has the power to knock viewers off their moorings, pushing them to see irony in every uncanny twist—on the show, and in real life. 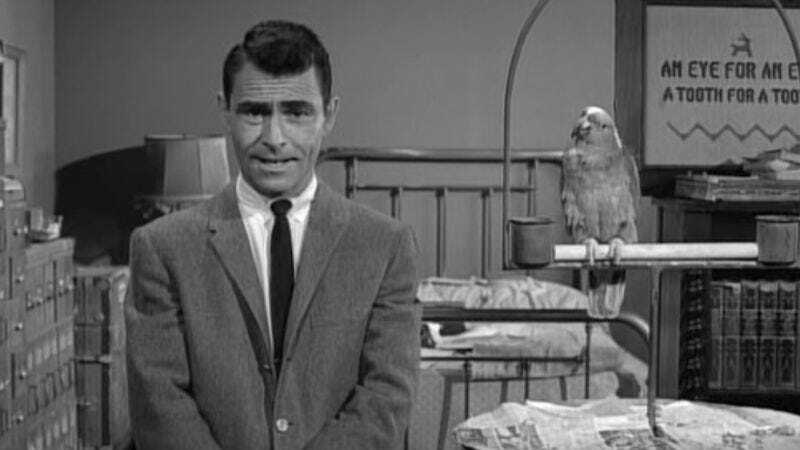 As our own Twilight Zone TV Club Classic reviews return February 23, here are 10 episodes designed to explore all the darkest corners of Serling’s show. “Walking Distance” (season one, episode five): Serling was keen enough to realize that science fiction didn’t always have to involve rocket ships and rubber monsters. He won over less genre-friendly critics early in The Twilight Zone’s run with “Walking Distance,” starring Gig Young as a man who’s transported back to his own past and given the opportunity to talk to himself as a boy. As always, there’s a twist ending, born of the common Serling idea that time is a closed loop, unalterable. But what stands out more is the call of nostalgia in “Walking Distance,” as a grown-up walks through his childhood idyll—a town that Serling would acknowledge was inspired by his own hometown of Binghamton, New York. The Twilight Zone would continue to play with this notion of the past pulling characters back, most notably in Serling’s “A Stop At Willoughby,” in which a neurotic executive escapes in his mind to an imaginary turn-of-the-century small town, and Matheson’s “Young Man’s Fancy,” in which a mama’s boy visits the house of his late mother, and reverts to childhood right in front of his new wife’s eyes. “Time Enough At Last” (season one, episode eight): Easily one of the top five most remembered Twilight Zone episodes, “Time Enough At Last” was adapted by Serling from Lynn Venable’s short story about a henpecked bookworm (played by Burgess Meredith) who survives an apocalypse and is finally left alone to do as much reading as he likes. This being The Twilight Zone, complications occur—because more often than not on this show, when people get what they think they want, they’re profoundly unhappy with the results. (See also: Serling’s cruel season-five episode “Uncle Simon,” in which a woman who’s been waiting her whole life for a mean, rich old relative to die gets a rude surprise when he finally passes.) “Time Enough At Last” is a classic not just because of its O. Henry ending, but because when the meek Meredith steps out onto a depopulated city street, his reaction encompasses all the loneliness—and paradoxical yearning for loneliness—that was one of the show’s recurring motifs. “The Monsters Are Due On Maple Street” (season one, episode 22): One of the reasons Serling created The Twilight Zone was so he could tell stories about real-world social problems without calling those problems by name. “The Monsters Are Due On Maple Street” tackles foolish human prejudice, showing how neighbor turns against neighbor when a power outage leads some to suspect an alien invasion. The madness of crowds has long been a staple of thrillers, and it’s a premise that The Twilight Zone would tackle often—as in Serling’s more ham-fisted season-three episode “The Shelter,” in which neighbors come to blows over space in a friend’s fallout shelter. “The Monsters Are Due On Maple Street” is more pointed than most. From its location—a backlot that had previously been used for the wholesome Andy Hardy movie series—to its “just because you’re paranoid doesn’t mean they’re not after you” ending, this episode argues that even when there’s a real external threat, ordinary Americans will overreact and do the enemy’s job for it. “The Eye Of The Beholder” (season two, episode six): It’s hard to describe some of the most famous Twilight Zone episodes to newcomers without revealing their endings, and since sometimes the ending is the best part of a Twilight Zone, it’d be unfair to spoil them. (Warning: The book To Serve Man in “To Serve Man” is… well, no, best not say.) But sometimes, even when the best Twilight Zone sucker-punches are fairly obvious, there are other redeeming qualities. In “The Eye Of The Beholder,” a woman awaits the results of a plastic surgery designed to make her look “normal”—a word that turns out to have a very different meaning in the place where she lives. Because all the characters’ faces are carefully hidden from the audience for nearly 20 minutes, it’s clear early on that some reversal is coming, but the expressionistic lighting and the meditation on the significance of “beauty” make “The Eye Of The Beholder” powerful regardless. It’s another one of the Twilight Zone episodes that often leaps to mind immediately when casual viewers talk about the show. “The Invaders” (season two, episode 15): Though the Matheson-penned “The Invaders” has one of the most genuinely surprising twist endings in Twilight Zone history (albeit one that the show tried more than once), that’s not what makes it a series standout. No, what’s remarkable about “The Invaders” is how effectively stripped-down it is. Agnes Moorehead plays a mute woman who fights off a tiny flying saucer manned by creatures in bulbous space suits. And that’s it. There’s almost no dialogue and not much in the way of setup or story. It’s just one lone person fighting for her life for 20 minutes: an exercise in raw terror. “Long Distance Call” (season two, episode 22): The Twilight Zone wasn’t cheap to produce, with new sets every week and often-fantastical makeup and special effects. To cut costs, CBS asked Serling to try shooting on video in the middle of the second season, and while Serling’s years of working in live TV had made him familiar with writing and staging for video, the show never really felt right with the constrictions that the medium demanded. Still, there are a few winners among the six video-shot Twilight Zones. The first of the batch, “The Lateness Of The Hour,” is another of Serling’s irony-filled examinations of prejudice, following the comeuppance of a young woman who resents her family’s android servants. And the last of the batch, “Long Distance Call,” is one of the show’s creepiest half-hours. Written by William Idelson and Charles Beaumont, “Long Distance Call” is about a toy telephone through which a child receives messages from his dead grandmother, urging him to join her in the afterlife. The limited setting pays off here, in an episode where drab reality contrasts with the imagination of people and places beyond. “Person Or Persons Unknown” (season three, episode 27): One of the reasons why The Twilight Zone resonated as it did is because Serling and his writers touched so often on common anxieties. In the Beaumont-written “Person Or Persons Unknown,” an everyman played by Richard Long wakes up to discover that none of his friends or family members recognize him, and instead consider him a dangerous lunatic. It’s not just that there’s no record of the man’s existence; the hell of it all is that he has unshakeable emotional attachments to people who now regard him as a stranger. That’s what sets up this episode’s devastating twist ending, where circumstances are inverted and the protagonist becomes lonelier than ever. “Miniature” (season four, episode eight): The Twilight Zone was effectively canceled at the end of its third season, when the show had trouble attracting a sponsor. CBS gave Serling a reprieve when he agreed to let The Twilight Zone be a mid-season replacement, taking over a timeslot vacated by an hourlong drama. By then, Serling’s co-producer, Buck Houghton, had decided to move on, and Serling himself was contributing fewer scripts. Generally speaking, the 18 hourlong episodes of season four are significantly hobbled by the extra screen time. The Twilight Zone was a show that relied on the simple idea and the quick hit, neither of which was suited to sprawl. But they’re not all losers in season four. Beaumont’s touching “Miniature” stars Robert Duvall as a social misfit who becomes obsessed with a doll he watches at a museum, convinced that the toy is leading a sad little life, just like him. Duvall’s performance is full of nuance, and Beaumont’s script is more like the film Marty than a typical Twilight Zone. The episode makes a nice companion piece to Serling’s season-one classic “The Lonely,” in which an isolated prisoner of the future has to choose between his robot companion and a full pardon. Here, Duvall has to decide whether to live in an ersatz world or commit to the real one. “Living Doll” (season five, episode six): Though primarily a science-fiction series, The Twilight Zone developed a reputation as one of the scariest shows on TV, dating back to season one’s horrific ghost story “The Hitch-Hiker.” In its fifth and final season, The Twilight Zone went to the horror well more often, producing several of the series’ most memorable episodes (including “Nightmare At 20,000 Feet,” in which William Shatner plays a nervous flyer who sees a gremlin on the wing of a jet airliner). Among those memorably scary—and funny—season-five episodes is “Living Doll,” written by Beaumont and Jerry Sohl, and starring Telly Savalas as a crank who resents the money his wife spends on toys for his stepdaughter. When one of those toys—a talking doll voiced by the legendary June Foray—threatens to kill him, the stepdad initially laughs it off, and then learns that an inanimate object can be pretty dangerous. The Twilight Zone wasn’t as sharp in its final round of episodes as it had been over its first three years, but “Living Doll” is true to the show’s mission of taking the ordinary and making it seem alien. Availability: Four of the five Twilight Zone seasons (all but the hourlong fourth season) are available on Netflix Watch Instantly, among other streaming services; all five are on DVD and Blu-ray, and also available to purchase digitally from Amazon and iTunes. Up next: Kyle Ryan contemplates another kind of unreal nether-realm: the late-night talk show, as depicted in Garry Shandling’s landmark HBO sitcom The Larry Sanders Show.